Somehow I got wind that the Star Trek Deep Space Nine documentary, “What We Left Behind,” was having a NYC screening. I backed at the DVD level though, so I wasn’t invited! No matter, I drove in and waited in the lobby. 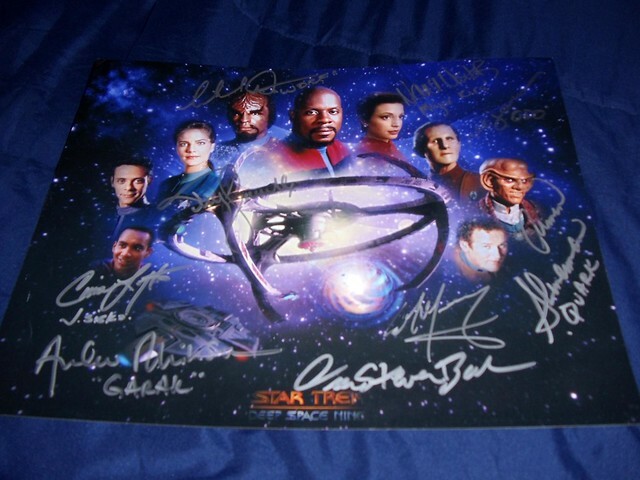 I got a photo and had show runner Ira Steven Behr sign my cast piece. He told me who else was coming, but the few didn’t excite me. Well, one kinda did, which was Felecia M. Bell, who played Captain Sisko’s deceased wife, Jennifer, for a few episodes. I got her leaving, and she was very nice. After that, I met up with Wong, and we did a few spots. First we waited for Christopher Lloyd, who tried sneaking out. 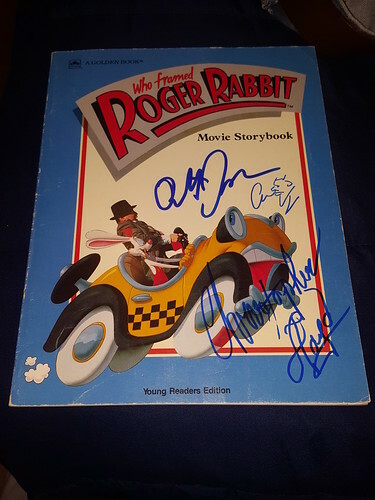 Wong got him to do the photo, while I pleaded and got an autograph on my Roger Rabbit book! I grabbed some food, and we set out to the next spot. 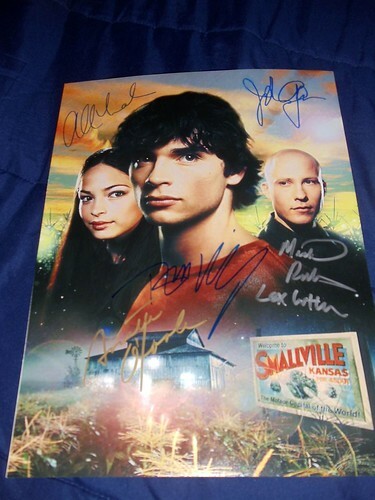 There we waited for Annette O’Toole from Smallville. Wong wanted the photo, while I just wanted my cast piece signed. Her husband Michael McKean showed up to greet her. We got photos with him and she gladly signed for me. Moving on, I tried a spot that was an utter mess for members of The Good Fight. I mainly wanted Michael Boatman, who was in Arli$$, and he was cool and did the photo. The arrival was later than I hoped though, so I couldn’t try the way in for F1 superstar driver Lewis Hamilton. Instead, I drove to another spot for Melissa McCarthy and Richard E. Grant. I started getting worried they would show up at all, but they finally did. Grant did a photo no problem, but I got another because the first one was zoomed in a lot. McCarthy arrived and was led in a side door, but said she was late and had to hurry. For the way out, a few people I knew had arrived. They got Grant too, and to our glee, Melissa was nice, and took photos and signed when she left! I then drove downtown and waited for Lewis. Eventually his car pulled up, but before I can say anthing, his group turns and walks away. Huh?? Well they walked to the restaurant across the street and went in, so I was forced to wait another 45 minutes or so. Right as he was walking out, the rain picked up big time, and Lewis took off for the door here. I screamed LEWIS LEWIS and waved my camera. To my surprise, he stopped for me. I asked and he signed an old magazine for me, and took the selfie. The photo came out fuzzy though, probably because of the flash hitting the glass door he was holding open. In any case, it was cool, because he pre-taped an appearance later in the week, and I would have missed him there. Speaking of pre-taping, I lucked out the next night, which became a bit of a Grand Tour. First, I started at a messy spot, but I wanted my Dale Jr. stuff signed. I had a 2008 release 1:24 diecast of his 2004 Daytona 500 winning car, plus a 2012-ish mini-helmet. He was super, and signed them on the way out. With a good photo this year, and good merch signed, I no longer have to go for the guy! Anywho, I hit a TV spot, where to my surprise, Robin Wright was taping a day or two early. This was great, because I really didn’t want to try for her at a “ticketed venue.” Just as well, because she did nothing there. Anyway, she arrives and starts signing. I reach over for a selfie, which comes out fine. She only got through about 2/3 of the line, and then turned and ran in. My mistake though here was not waiting for Lin Manuel Miranda to exit, because he wound up doing for all there. Instead, I tried a spot nearby for John Stamos. I hoped he would arrive early but he did not. I got an upgrade with Penn Badgely, but when Stamos got there, the dealers were on site. He signed a bunch, so I got my Full House cast piece signed, but did only a couple photos. Leaving he blanked entirely. Unless Andrea Barber suddenly becomes friendly about signing, that piece is complete. The Olsen’s will never sign. Moving on, there was an event for The Connors, less Roseanne, which I heard was not too good. The cast didn’t do much there. I didn’t know the hotel, but took a flyer that maybe they were using the same one. I got word that they left the venue, so a collector Paul and I RAN over there. Lecy Goranson, who has foiled and denied me so many times in the last 2 years, arrived and YES finally did the photo. Never saw the other cast members, so I still need Sara Gilbert. Prior to going home, I took the subway back to my car, which was parked for free way down by the Holland Tunnel. I got there, but decided to try one last thing. Harvey Firestein and Jane Curtin were doing an appearance close by. I need both, but I have heard terrible things about Jane. I walked over, and saw 3 graphers. Jane left, and refused to sign, which is what the graphers have told me in the past. Well I figured there’s no harm in asking, so I caught her and asked for the photo. As hard as she denied the graphs, she happily agreed to the photo. She even took a second one as we both were startled by the camera flash on the first one. A grapher jumped in for his own selfie, later commending me for getting her to do it. Harvey was much easier, and I got the selfie. Ahhh, the week would conclude quite oddly. I went out for some spots featuring Hugh Grant, Sigourney Weaver, Meryl Streep, and others. Everywhere I went, it was a big time bust! Way in for Sigourney had terrible access and setup, and couldn’t get anyone. I gave up and left, trying what I figured was an easy spot for Allen Maldonado from The Last O.G. Well he was in early so no dice. I then drove to the Grant spot, and guess what? Yep, he got there early too. Around this point, Capman starts sending me messages about a secret retirement party for Carroll Spinney aka Big Bird. We both surmised that other Sesame Street and/or Muppet performers would be there. Now, I should have just driven home to NJ, got my items, and driven to the party in Queens. I definitely had enough time to do it. Instead I dillydallied and didn’t have the time to do it. So I drove out there, and parked. People were leaving the party, so I didn’t know what to expect. I saw a photo though with Loretta Long aka Susan. The party seemed to end and they wheeled Spinney outside, and 25+ people exited with him. I instantly spot Long, and go to talk to her. She was very nice, and her date took our photo. She also let me know that Linda Bove was not there, so don’t wait for her. I was going to leave, but I see a guy that looks familiar. I ask someone, and sure enough, it’s Dave Goelz! He of course played Gonzo as well as other great Muppet characters and on Fraggle Rock. Dave was super cool, and chatted for a few minutes, before I got the photo. Again, big thanks to Capman, though I really wish I had my stuff to get signed! No idea if I’ll ever see Loretta again. I returned to Manhattan, where everyone including Sigourney and Streep blanked when they left their party. wow Gonzo! That is a painful miss! Super jealous of Jane Curtain!!! Awesome stuff. Funnily enough, I saw Sara Gilbert about a week or two leaving my workplace. Awesome stuff! Great Jane Curtain pic.. so rare!